Seven of the major entertainment companies of South Korea have decided to establish a K-pop MV content distribution and management corporation. The companies in question are —SM Entertainment, JYP Entertainment, YG Entertainment, Mystic Entertainment, BigHit Entertainment, FNC Entertainment and Star Empire. 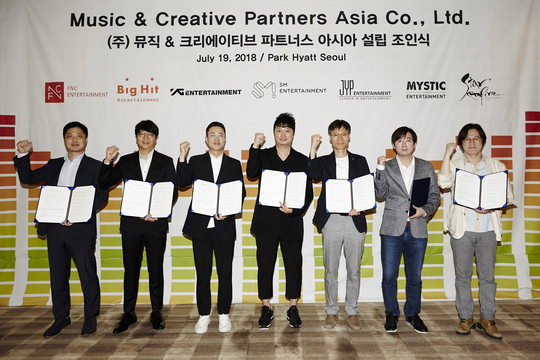 The new organization, dubbed ‘the South Korean VEVO*‘, has been tentatively named “Music & Creative Partners Asia Corporation” (MCPA) at the signing ceremony of the joint venture. The event took place at the Park Hyatt Seoul hotel on the 19th of July. Delegates from all participating companies were present there to seal the deal. Check out photos from the signing ceremony below! Seven major Korean entertainment companies, including #SMEntertainment, to establish ‘MCPA’, a K-POP MV content distribution and management corporation. MCPA Co. will serve as a window for deciding and negotiating the provision of Korean contents to YouTube and other global digital service platforms. It will particularly focus on becoming a centralized distribution channel for K-pop music videos and other related contents to exploit the global attention the Korean music scene is getting right now. The organization hopes to create new business models which can increase the global competition for Korean music. In addition, MCPA Co. will also continue to explore different methods to expand into a larger company that can represent Asia as a whole. To do that, it will secure broadcasting platforms and produce new contents using relevant IP. Lee Dong Wook announces his own global fan page!